Gorilla trekking is the process or an activity where you move to the wild just to see the gorillas. In Uganda, the activity is done at Bwindi Impenetrable forest national park. 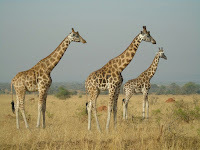 Game drive is another activity where you go see other animals like the climbing lions, cheetahs, Leopards and many more. Game drive is done in most parks in Uganda namely Queen Elizabeth national park,Murchison falls national park, and Lake Mburo national park. Here are some of the major difference between the two activities in Uganda. of one hour to be with the gorillas. During this period, you use the opportunity to take photos and clearly watch their behaviors. With game drive there is no stipulated time for you to see wildlife once you find it. With gorilla trekking,you are supposed to be 10 meters away from the gorillas. This is quite different with other wildlife as their is given distance between the tourist and wildlife. Gorilla trekking requires you to have a permit in order to see the gorillas- you don't pay entrance but rather gorilla permits.With game drive, you don't pay for permits; all you need is to pay for the entrance fee into the park where you are going to do your game drive. Gorilla trekking requires you to have a permit in order to see the gorillas- you don't pay entrance but rather gorilla permits.With game drive, you don't pay for permits; all you need is to pay for the entrance fee into the park where you are going to do your game drive. Both activities are truly amazing and if you would like to experience them, visit Uganda with gorilla tour booking Safaris. The 3 Days Lake Mburo safari takes you to the Lake Mburo National Park where you can spot various rare wildlife species like the Zebras, Elands, Impalas, lions, elephants, buffaloes, bush and water buck, leopards, Uganda Kobs, warthogs, bush pigs among others. We are very certain that you will find this experience very unique; it takes you to Kibale, Africa’s greatest tropical rain forests for Chimpanzee trekking. his 4 days safari takes you to track the mountain gorillas in Bwindi Impenetrable National Park and also experience Uganda's most beautiful landscape, Lake Bunyonyi in the most exciting way - canoe trekking riding through the beautiful islands of Lake Bunyonyi. A great journey across Uganda taking you in the highlights and Uganda’s best Safari parks. This safari has been long time favorite with safari enthusiasts.